Line a small baking dish with plastic wrap, leaving an overhang on all sides. Be sure it’s deep enough to hold the batter. In a medium bowl, combine the cheese and tapioca. In a small saucepan, bring the milk to a boil. Pour the hot milk over the tapioca and mix with a rubber spatula; the tapioca will immediately start to release starch and the dough will become thick and pasty. Season with salt, pepper, nutmeg and paprika. Pour into the prepared baking dish and spread evenly. Immediately cover with plastic wrap to prevent a skin from forming. Let cool at room temperature for at least 1 hour, then refrigerate for at least 2 hours or up to 5 days. Pour the vegetable oil into a heavy-bottomed saucepan and heat to 350˚F, as measured by a deep-fat thermometer. Unmold the tapioca dough onto a cutting board. Using a long knife, trim the edges and cut the dough into neat 1-inch cubes. 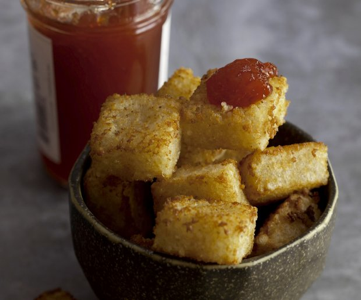 Fry the tapioca cubes in batches, adding only as many as will fit without touching. Turn occasionally with a long slotted spoon, preventing them from sticking together, until evenly browned on all sides, about 3 minutes. Transfer to a baking sheet lined with paper towels. Continue working in batches until all the fritters are fried. Serve immediately. Cooking Tip: You can bake these in a 350°F oven for 12 to 15 minutes, but frying brings the best crispness to the plate. Serve them with red pepper jam on the side if you like.